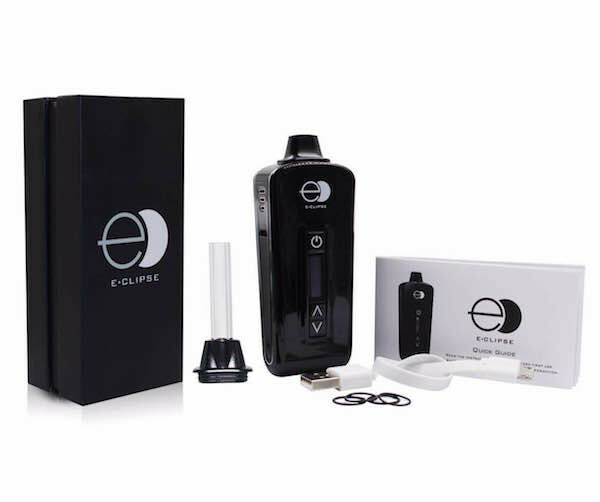 The E-Clipse is a small, digital electronic convection dry herb vaporizer with a ceramic heating chamber and full degree-level control over temperature from 300° to 435°F (about 150° to 225°C). It’s just about 3.5″L x 1.5″W x 0.75″D (90 x 40 x 20 mm), easily disappears in your hand, and costs $139.99 $119.99 (as of August 2018) with free USA shipping. This vape comes well-packaged in a small, tight-fitting presentation box with the accessories underneath, which include a cleaning brush, dab-style tool, USB charging cable, extra mouthpiece and spare silicone O-rings. Its 2200 mah lithium polymer battery charges in a few hours via a micro USB port, and it has a fairly large ceramic heating chamber that’s about 5/8″ deep and 3/8″ diameter. I’ve been using the E-Clipse for the past few weeks with a variety of strains, while alternating with a number of other vapes. I’ve found that I keep gravitating to the E-Clipse because of its speed and taste. You’ll be tasting terpenes from the E-Clipse in mere seconds after turning it on. In testing, the E-Clipse gets to THC-vaporization range in 30 seconds and hits my high set point of 392°F in just 50 seconds. Most people will use the E-Clipse as a portable vape, using the standard mouthpiece that sticks out less than a pinky’s width from the vape body. Maybe it’s a holdover from my early days with the MFLB, but I prefer the alternative one that E-Clipse included, which has a short glass tube to inhale from. 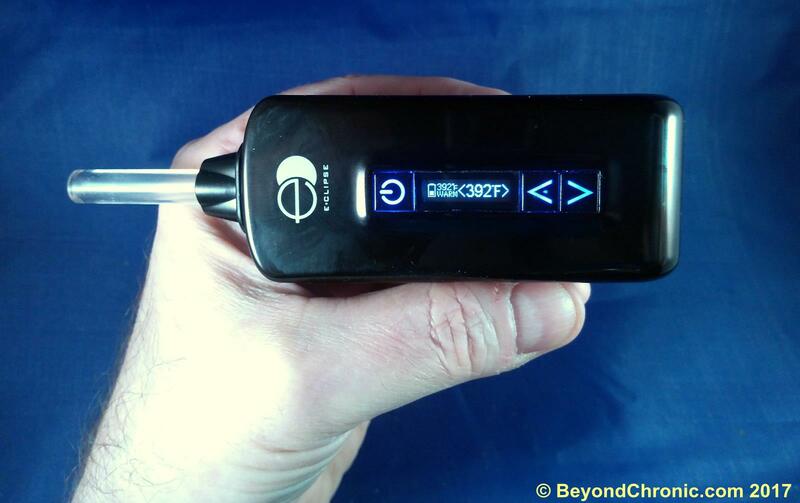 The E-Clipse vaporizer is probably most similar to Grenco’s G Pen Elite, and although it’s on NY Vape Shop’s site in the “Vape Pen” section, don’t be fooled: this is a true vaporizer! I’m making that distinction because I have yet to see a pen-style vape that does not actually combust. In any case, this vape is quite small, and works very well. I’ve actually been breaking all the rules with this thing. Here’s a supremely portable and super-discreet vape that I’m using exclusively at my desk. I’ve been too lazy to grind lately, so I just pull chunks off buds and stuff them into the chamber, and still everything works fine. But as I said, I really enjoy how easy the E-Clipse is to use, so I’ve been using it much more often…quite a bit in fact…and the battery still lasts for days! The E-clipse has another cool feature you probably won’t read about anywhere else. It holds enough heat internally (without feeling overly warm, I might add) that you can easily take 3 or 4 good tokes even after the power is off! So keep that in mind if you’re trying to microdose…I hate wasting those hits! The only thing that bugs me about this vape is that, because of the smooth rounded bottom which makes it so easy to hold in your hand, you can’t stand it up on its own for loading purposes. That’s pretty much the smallest complaint I’ve ever had about a product, and it’s not much of a big deal! Greg, who is co-founder of the NY Vape Shop (one of the only sellers of this brand online), told me that the E-Clipse vaporizer has been out since late 2016 and was designed by the company in New York that launched both the E-Clipse and Saber Vape brand. Greg assured me that NYVapeShop.com carries replacement parts for the E-Clipse if necessary, and that they have a loyalty program and free US shipping policy. Greg also told me that if you use our BC420 code during checkout, you’ll not only get 15% off your order, but you’ll also get a free gift with any purchase (this could be a mini grinder, mouthpiece, silicone dab container, coil, dab tool, filter screen or ??). Pretty cool all around! Sorry you’re having such a bad time. It might well be that the cannabis you’re getting there is just not up to the quality of legal medical stuff we have here. But you’re right,it does clog a bit. I am struggling creating ecig juice from concentrate! Please help! Please read our article on e-cig juice and if you have a specific question, post that in the Questions area. Thanks!